I had a question around how Virtual SAN read IO is handled when data can be anywhere: read cache, write buffer, disks. On VMTN one of the engineers recently explained this. I figured I would create a quick diagram to illustrate it. Basically how it works is that VSAN will check the read cache, if the block that needs to be read is not available in the read cache it will check whether the block is in the write buffer or on disk. Simple right? 1) when the block is served out of the write buffer on esxi-01, does it get copied into the read cache? I would expect so, but I don’t know for sure. 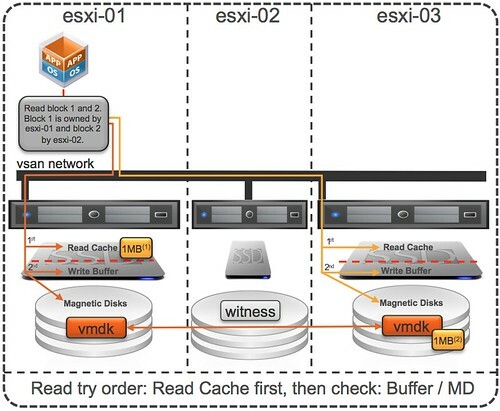 2) when the second block, served by esxi-03’s disk, is provided to esxi-01, does it go into the read cache of esxi-03 or esxi-01? Both? Neither?